I work in copper wire and glass. 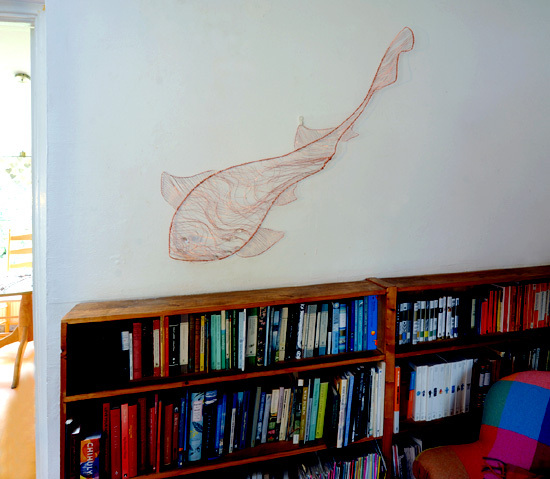 I make representational sculptures of birds, fish and clothes. My sculptures are like 3 dimensional line drawings. They are made of fine copper wire and glass. They can look fragile, but are actually robust. They have been described as ghostly. Copper wire is versatile and inexpensive. This gives great freedom to my work. I love line drawing, and shaping and bending wire is yet another form of line drawing. I can therefore work very big or very small and be quite experimental in my subject matter. I love working small; making children’s clothes – tiny dresses, jeans and sandals or big and flamboyant; designing sea eagles with a 2 metre wingspan or a 5 metre trailing jellyfish! I love to use colour. I patinate my copper wire verdigris or heat seal the raw copper with lacquer. I also decorate my work with mother of pearl, rock crystal, amethyst, and glass beads in myriad colours ranging from lime green, to mauve to pale gold. I source small gold hearts from Murano, iridescent mother of pearl from China, tiny abalone shells from Connemara and pink buttons from the Dublin Woollen Mills. I try to evoke the mood & character of a person, by my sculptures of clothes. The wire clothes range from filigree christening robes, to sturdy blue jeans, tiny baby shoes to romantic ball gowns. 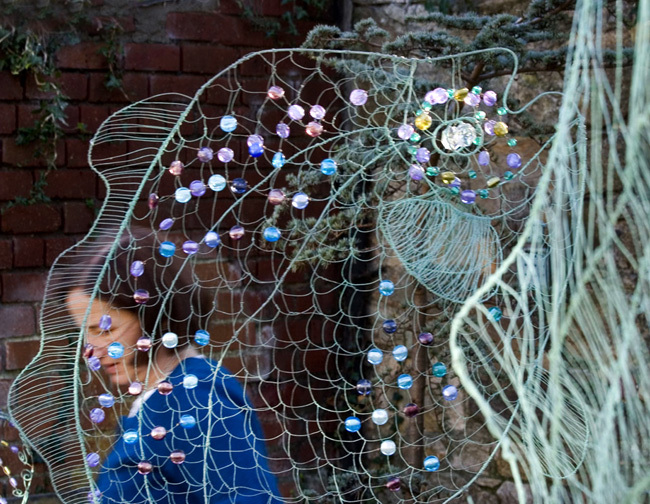 My sculptures of birds and fish and butterflies try to evoke the wonder of the natural world. My sculptures add gaiety and joy to homes; dancing above a kitchen island, in a child’s bedroom or as a centrepiece in a modern living room. They can also enhance apartment balconies, city courtyards or suburban patios. They can look lovely hanging from a birch tree, moving with the breeze. My poetry plaques can form pathways in gardens, wall murals or enhance an oasis of a meditation garden. I aim to make sculptures that lift the spirit and make music in the heart. Susan worked as a librarian for 25 years in Dublin City University while studying at night in NCAD & Dun Laoghaire College of Art. While working as a librarian, she exhibited at a national level in exhibitions such as the Claremorris Open & Iontas. 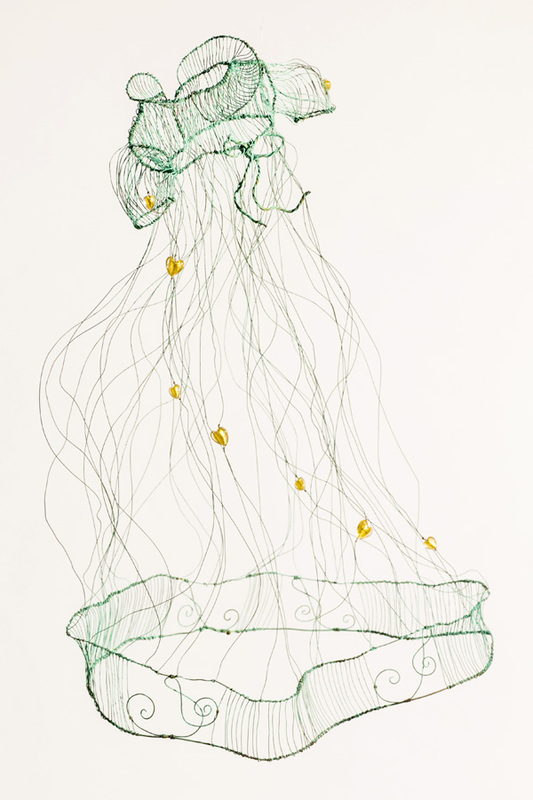 She studied drawing & painting at night in NCAD & Dun Laoghaire College of Art, but is very much self-taught in wire sculpture, having initially spent a year, making 15 pairs of wire shoes, to teach herself dexterity with a pliers. Susan has a primary degree in Economics & French from UCD and a Honours Diploma in Library & Information Studies, also from UCD. Her background in academic research has helped her in her exploratory work with copper wire, patination & powder coating techniques.